Hunger Heroes = Children and Young Adults fighting childhood hunger in Arkansas! We’re asking for nominations for children and young adults to be Hunger Heroes to help us fight childhood hunger in Arkansas. 1 in 4 kids in Arkansas are at risk for going hungry. 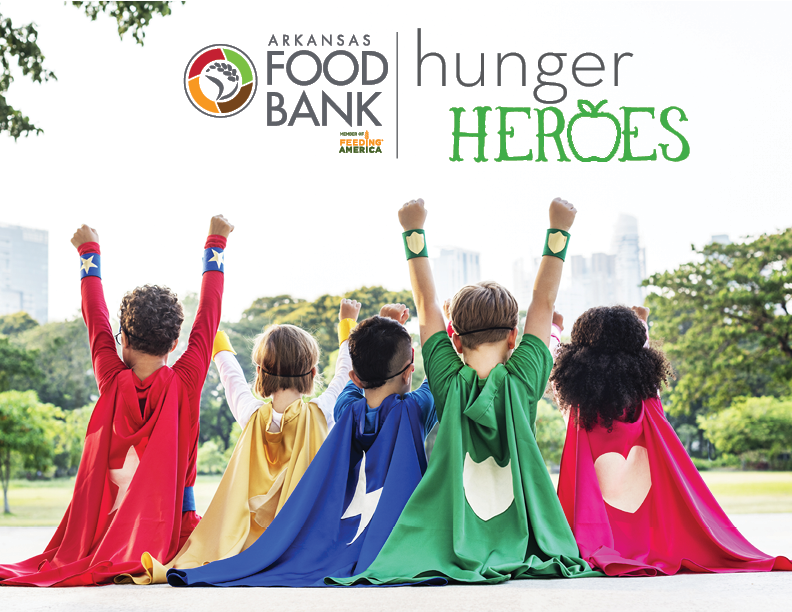 The Arkansas Foodbank is fighting every day to help change that, but we’re looking for Hunger Heroes to help us! Hunger Heroes will give kids and young adults the opportunity to help raise funds and awareness for the Foodbank’s Food For Kids program. This program helps us fund key children feeding programs like our Backpack Program, Summer and Afterschool Feeding and School Pantries. Nominees in the Kids division will have a fundraising goal of $500 (which equals 2,500 meals) and nominees in the Junior division will have a fundraising goal of $1,000 (which equals 5,000 meals). We encourage each nominee to find unique ways to raise funds- hold a bake sale, collect change at your school, get family and community members involved, get creative! Our overall goal is $25,000 which would equal 125,000 meals for hungry Arkansas children. Each nominee will have their own personal fundraising page and will be able to track their progress. Nominations are open from December 10th, 2018- January 11th, 2019. Nominees will attend a kickoff party at the Arkansas Foodbank on Tuesday, January 15th. Nominees will wrap up fundraising on Friday, February 22nd with a wrap up celebration on Thursday, February 28th. Each person that collects the most donations in each division will win a prize pack. Hunger Heroes will also have an opportunity for hands on service with the Foodbank. One is at our Saturday work day on January 26th from 9am-Noon and the other is our Family night on Tuesday, February 12th from 6-8pm. We will work with nominees that want to come volunteer but can’t on either one of those dates to ensure they have the opportunity to come on their own time that works for them. In addition to volunteering with us during the fundraising period, all nominees will be invited to join us for one of our Food For Kids Pack-a-thons in September and December to come and help pack the backpacks full of food that they actually helped fund through Hunger Heroes.